I live in the Chicago area but have never been to Alinea. A friend is visiting from California and we are planning to get tickets for September. 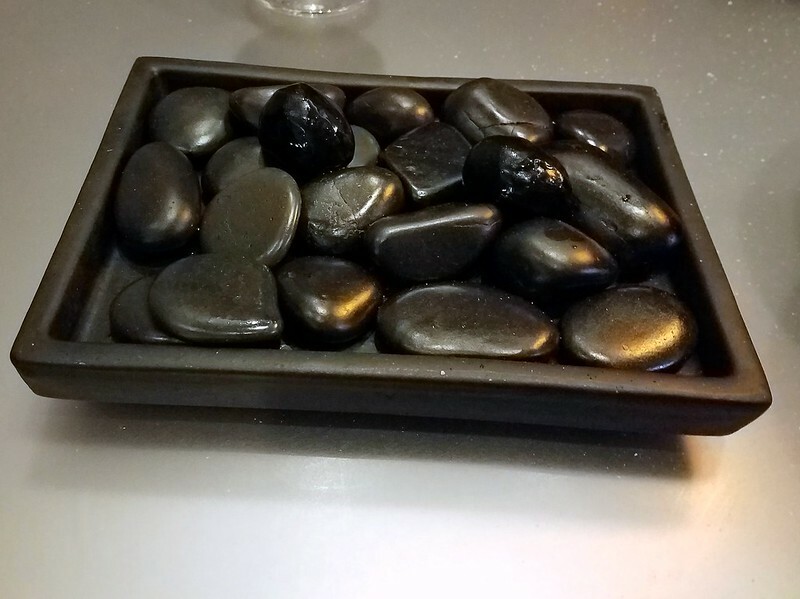 I have heard that the Salon is amazing and more than enough, but my friend is worried we won't get the "full Alinea experience" unless we do the Gallery. 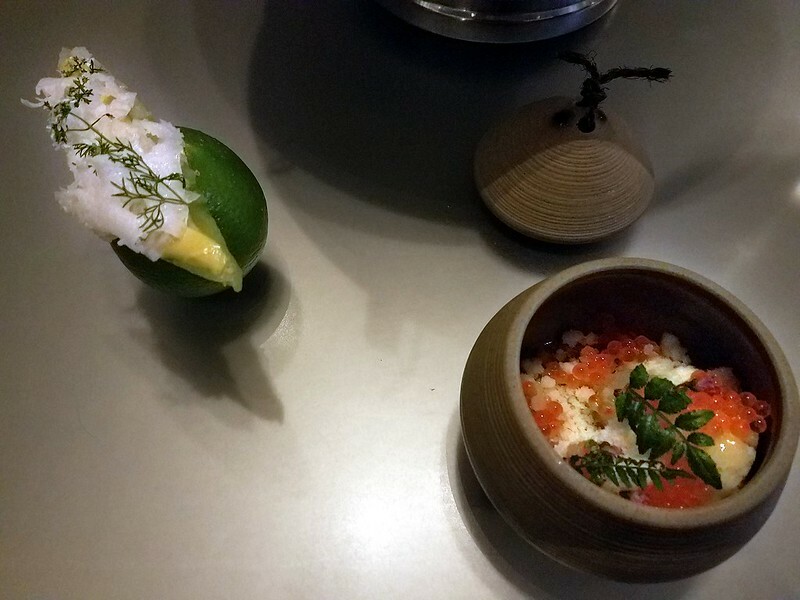 I didn't see anything on this site about Alinea since just after it was revamped last year. Any recent thoughts on whether the Gallery is worth the extra $$? We're willing to do it if it is, but I thought you all might be able to provide some valuable input. Golly. No response to the last post. Surely there are plenty of folks who have been. I would swear I'd even seen a post or two. But I can't find anything now. Either my search skills have deteriorated (likely) or there's nothing here. Anyone? I haven't done both so I can't really compare with what they're offering in the Gallery, but I had dinner in the Salon since the revamp and it was absolutely stellar in every respect, worthy of Alinea's reputation as among the world's best restaurants and most exciting culinary experiences. I think Royal Lichter's post, which preceded the above question by three days, also provides an answer to the question being asked. I'm too embarrassed to admit that I missed his review this time around since the search function took me to the end of the thread and I didn't have the common sense to go back a page. His was the review I recalled seeing before. Thanks for pointing out what any 7-year-old would have thought to do. However, the question stands--any other thoughts on the subject? Or even thoughts on one or the other from recent visits? We’ve been to Alinea several times but not for a couple years and not since the re-concepting. We were very much looking forward to our return. In a nutshell, both the Lovely Dining Companion agreed that we were unexpectedly and unhappily disappointed. Service ranged from excellent to sycophantic to nervous; food ranged from delicious to embarrassing. One server was top-notch: he knew the food, he knew the wines, he was easy to talk with, and he was comfortable. The server who welcomed us was a caricature. He recited the script properly (if stiffly) but he was clearly uncomfortable and managed to put us on edge every time he appeared. Service varied accordingly. There were some odd gaffes: the Lovely Dining Companion doesn’t drink alcohol and, to their credit, they offered her a selection of non-alcoholic drinks at the outset. She chose one, drank it over the course of the meal, and no one ever offered to refresh or refill—or even remove—the glass. It was just ignored throughout the course of the evening. Another example: at one point, there was an inexplicably long delay between courses. Mostly the timing was fine (though the LDC insists that she felt rushed on occasion), but this gap was extraordinarily lengthy and when service resumed, there was no mention, no explanation, no comment. The food itself also ranged from excellent to simply unfortunate and just not good. For where Alinea has always been and hopes to remain, the evening was just not acceptable. The Lovely Dining Companion observed that she missed the old entrance, the surprise that you get when you first walk in. It sets the stage for everything. The new interior feels too slick and not quirky. I didn’t miss the old one but at 4:50 on a Thursday evening, there wasn’t enough room for the people arriving, checking in, and checking coats. It’s just too narrow a space. The Asian pear snow portion of the course was very good: a nice contrast of textures and flavors, and a nice opener. The romaine spear accompaniment (at least, I think it was intended as a complement) was a rib without much leaf and had correspondingly little (to no) flavor. The avocado and tosaka (seaweed) were simply too delicate to add much. Having finished the first course, our attention is drawn back to the table. Think orange. See orange. Smell orange. 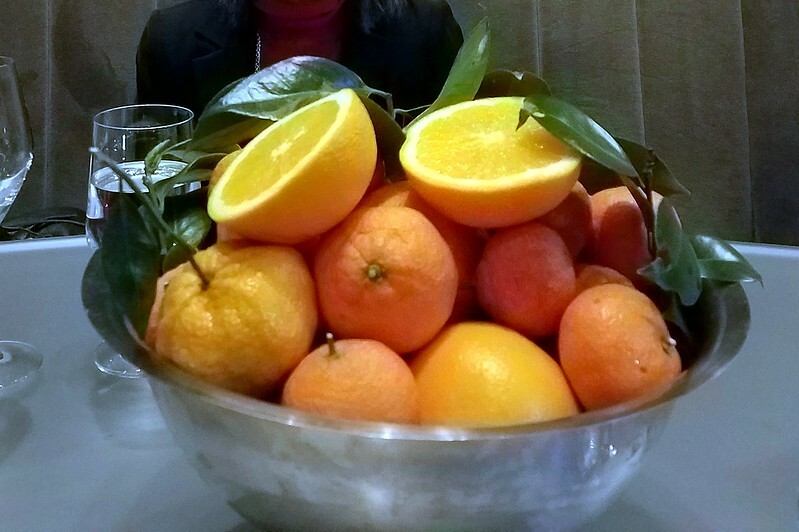 The table was decorated with a bowl filled with oranges (and related orange-colored fruits and leaves). A halved orange gave off the slightest of scents. Then, the curtain rises as a server ostentatiously pours “boiling” water into the bowl and the dry ice (surprise!) generates a steady, long-lasting fog and, more important, releases more scent. With the table now set, the server brings an excellent dish combining unexpected things in a way that the sum exceeded the total of the parts. Crab and orange? The crab was a smallish portion but astonishingly rich and the coconut and curry combined for a terrific course. Think black truffle explosion. With orange. Extremely photogenic, very clever, very well done. And good too. The squid, we were told, was flown in from Tsukiji Market in Tokyo. More the pity that it was just a bit overdone. Not quite too enough to be chewy but definitely too well done to be melt-in-your-mouth. A real pity since the preparation was otherwise delicious. The black slug-like garlic reduction (I have no idea how to properly or adequately describe it) was excellent (and I actually hadn’t noticed its resemblance to a garden creature until I looked at the pictures afterward). The squid was complemented by this olive/roasted artichoke “side.” I presume the rocks are intended to recall the seashore. Texture and consistency, think clotted cream. 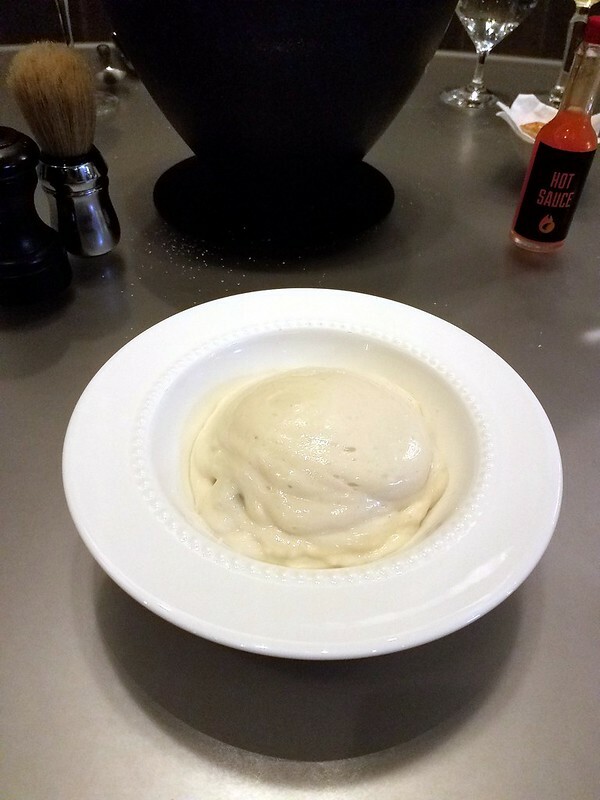 And, just like such a heavy cream, enormously rich, deep flavors. Another winner. At this point, everyone in the room was asked to get up and visit the kitchen. One entire long prep table (of two) had been cleared, and each diner had a place set with a small bowl of food and ready for a drink that was to be made in our presence. The young woman who did the preparation was slick, she knew her lines and her work. The drinks were made with the assistance of an intriguing piece of machinery about which I shall say nothing, the better to leave the experience a surprise for whoever chooses to go. The drink was made, mixed, and poured. We ate the accompaniment in the kitchen (sadly, neither of us recalls the details and there is no mention of course or drink on the souvenir menu) and we were all escorted back through the Gallery and back upstairs to our seats. Chef Achatz was there and, as is his wont, busy supervising the plating; he did not come over or even look up to acknowledge the visitors. One thought that occurred to me was that if I had sprung for the extra bucks for a Gallery table, I would most definitely not be happy to have a dozen or more people troop through the room on their way to the kitchen and then troop back through again ten minutes later to return upstairs. Three separate times (because the upstairs remains divided into three smaller rooms). Last observation on the kitchen visit: it was nice to get up, stretch our legs, and to go to the kitchen but it felt gimmick-y to us and put us in mind of a very similar experience at Eleven Madison Park. Back upstairs and settled back in to our seats, it was time for the next course. Langoustine dehydrated and crackerized. Bouillabaisse in the bottom. We were instructed to break the cracker up and let it rehydrate in the liquid. I guess this is cute, though I’m accustomed to having bouillabaisse loaded with seafood and fish, not just a broth (admittedly a very rich one). The cracker rehydrates pretty much as expected, turning the bouillabaisse into an uptown version of noodle soup. 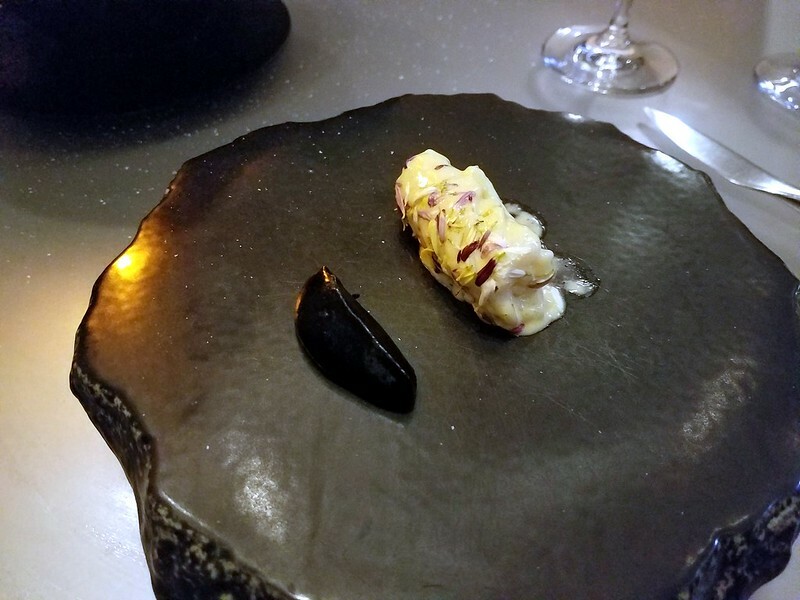 Sadly, the nori “roll” lost its crunch from being wrapped around a “wet” filling and the rouille was so toned down it couldn’t serve the traditional function of rouille, to cut through the richness of the bouillabaisse. Good taste loses out to clever. The beginning, sadly, of a trend for the rest of the evening. There was a fire in the middle of our table. A bowl filled with salt was lit on fire and we thought the presentation decorative enough, though of course we had no idea what was going on. Eventually the fire died down and a large spray of juniper was placed atop…wisps of smoke ensue…but the heat alone was enough to scent the air. While the juniper lay warming, we were presented with a venison blood sausage “beignet” with huckleberry jam. I remember little about it except that I was surprised at how much the filling had shrunk relative to the size of the beignet, an error I would not expect from a kitchen of this level. More than that, I can’t really say—which I suppose says something in itself. There is no picture of this course but if you blinked you missed it. Next, a server brought the chowder mise en place (below) to the table. 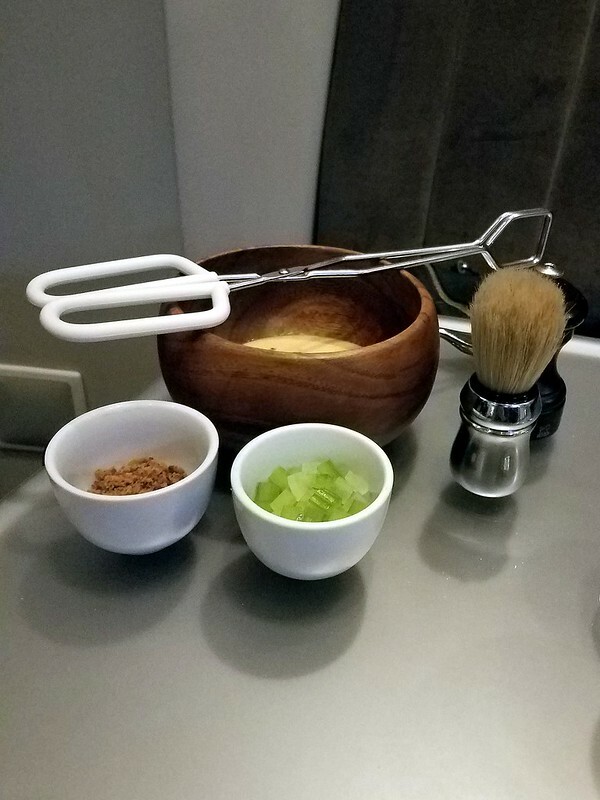 The tongs were used to fish out a potato buried deep within the salt and the old-fashioned shaving brush was on hand to dust said tuber. The potato was then smashed up in our bowls at which point the chowder was served, er, squirted. It tasted pretty much like it looked. 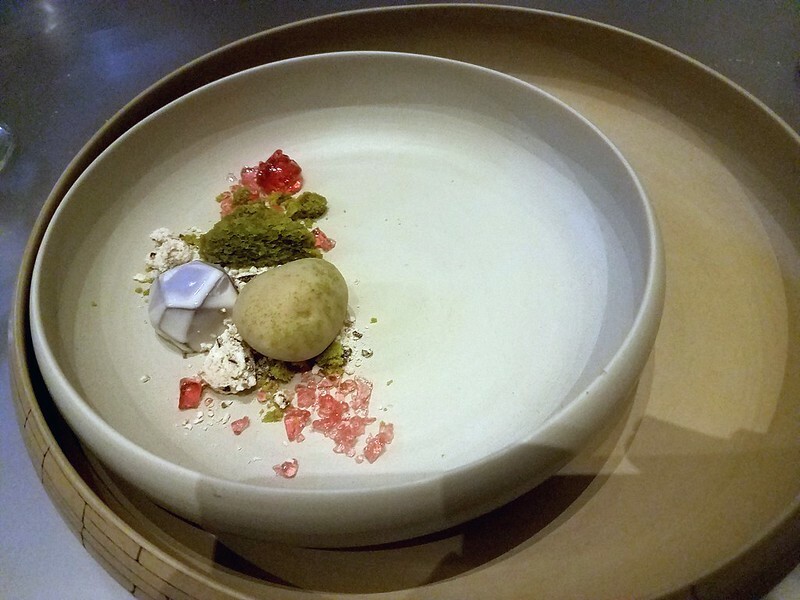 We were more than a little surprised to be served something looking like this: who in the kitchen could possibly have thought this an attractive presentation, no matter how much whiz-bang went into it? 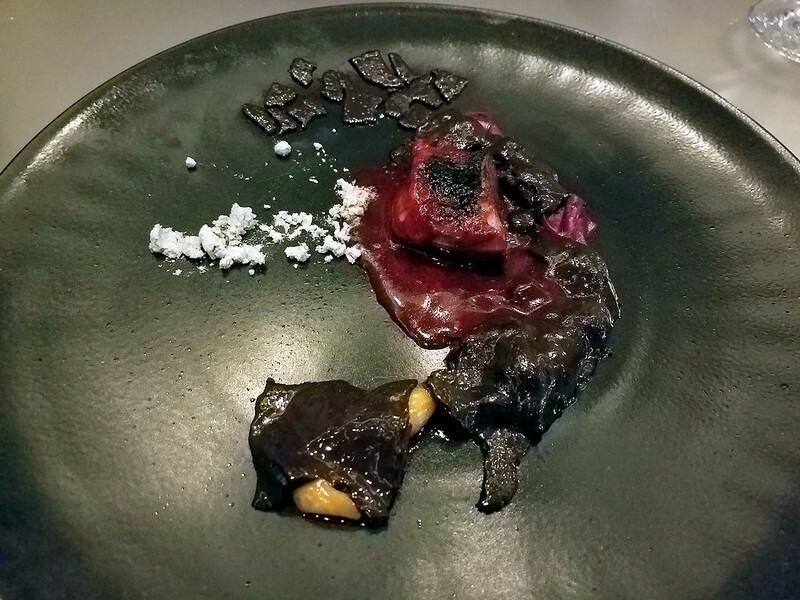 Even adorned with the solitary oyster cracker and sprinkled with the house-made hot sauce (served in a repurposed Tabasco bottle labelled “Hot Sauce”) this was not a remotely attractive presentation. Worse still, it was gooey, gluey, and not good. If I hadn’t known it was clam chowder, I doubt I would have guessed on the first two or three tries. Clever? I suppose so. Mostly just depressing. Not a particularly enjoyable course to my taste. The combination (blueberry and kale and mushroom) simply didn’t work for me and though I liked the presentation, I found that my disenchantment continued. Just no. 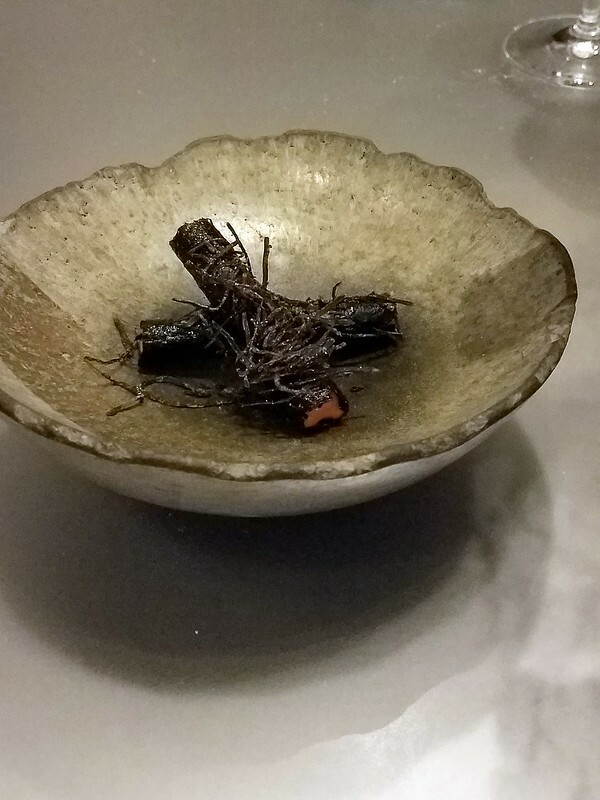 The squab was blackened on top because it had been cooked with a chunk of binchotan (Japanese white charcoal) atop it. The course is distinctly unappetizing to look at: gloppy looking, black food. It didn’t taste much better. The squab was good, but a tiny portion, and the rest is better left unsaid. Good. A nice accompaniment but the main dish itself was too far gone for this to rescue it in any way. We were a little surprised that this was it for heavier “main” courses: a bite of venison and the tiny piece of squab. No beef, no lamb, no anything else. Did we miss it? Honestly, yes. Was it a major disappointment? No. But we were surprised when dessert was the next course. Desserts were good, though it seems that “Childhood” has now been repackaged and appears as “Nostalgia.” Nothing wrong that or with any of the components except the sense of earlier successes being trotted out for another bow. Two things we both missed: bread service and the tableside dessert preparation. The role of bread service appears to be shifting significantly. It has gotten much fancier in many places and also (proportionally?) less generous. Although I’m happy to have artisanal breads made and served, I’d also be quite content to have a really simple, top quality baguette (or some such thing). But either way, I would really like something there. There has been discussion elsewhere on LTH about charging for (great) bread, but frankly, we really miss having no bread whatsoever. I just checked my reviews of earlier visits and at least in 2007, they offered it (as well as multiple butters) but not in 2011. The Progression had bread as well. It seems neither unrealistic nor unreasonable to expect something. Anything. And indeed there were a couple of times during the evening when for various reasons, I paused and had to stop myself from reaching for something that wasn’t there. It’s nice to be able to give your palate a rest from the onslaught of flavors and to better enjoy the wine. Not at Alinea. Nothing whatsoever. As Mike Gebert has observed elsewhere, there’s too much sleight-of-hand. To what end? At one point, you’re presented a glass bottle with what looks for all the world like a couple vanilla beans. So the vanilla bean in a jar is really vanilla-infused beef jerky. And? Just because you can do something doesn’t mean you should. It wasn't even very good beef jerky, truth be told, and it certainly didn’t complement the course in any way. The dishes we both liked came early on; things just declined after that. Except, perhaps, for the crab dish, nothing blew us away. We don’t expect perfection and don’t expect to love everything that comes out of the kitchen. But our disappointment was greater than just being unhappy with a couple courses. Nothing surprised or astounded us the way things did the first time (or even two or three) that we went. 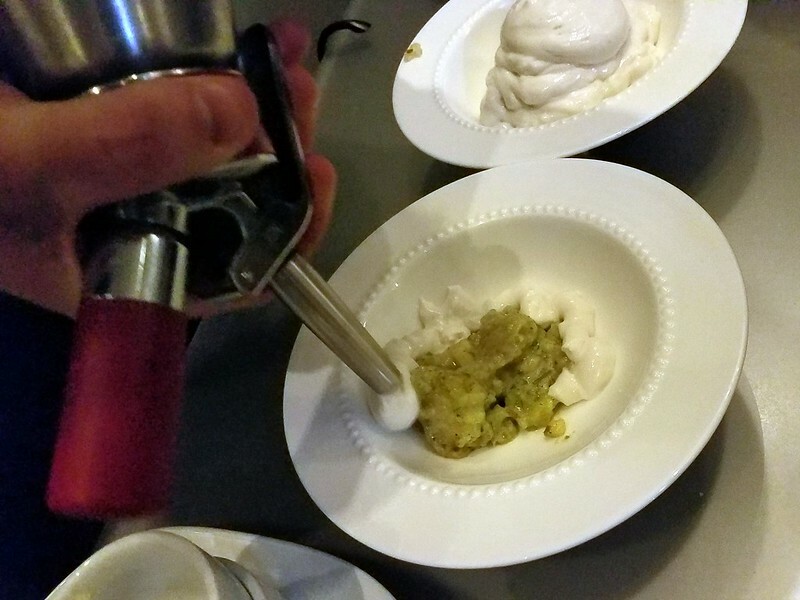 As I have written elsewhere, the Progression had some wonderful moments like the opportunity to drink shots with the chefs in the kitchen and hear Mike Bagale talk about how he put a particular dish together. 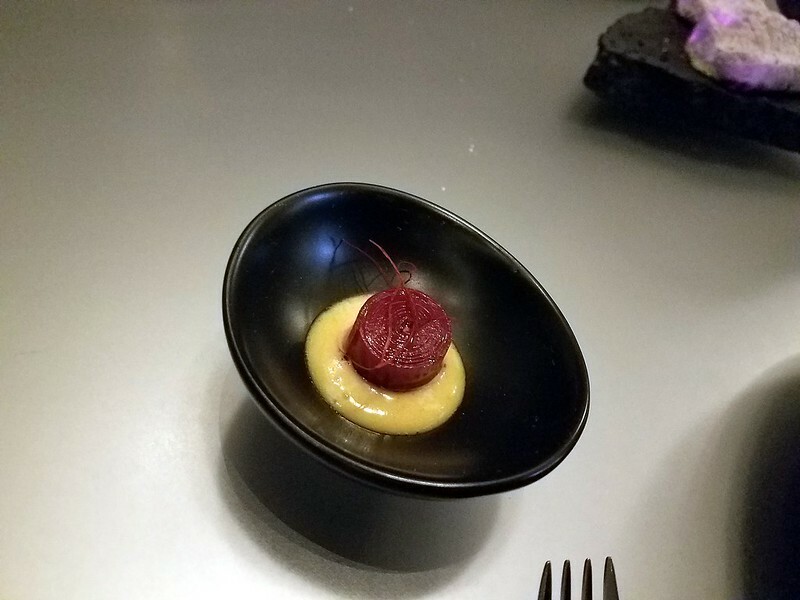 That's obviously not possible at Alinea with so many people, but since they are fully capable of coming up with creative moments, this meal was that much more disappointing. We understand the technology allows amazing things. 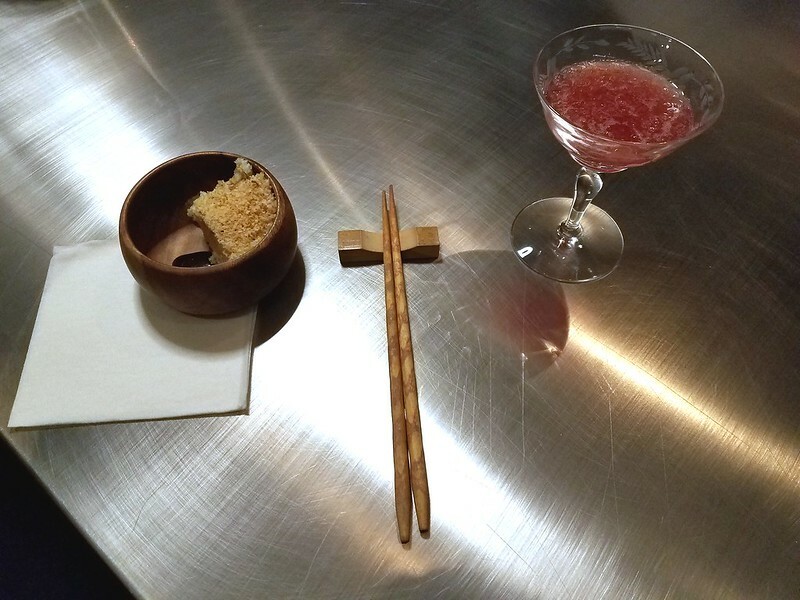 But ultimately, dining at Alinea is not about the bells and whistles. And when the theater and the whiz-bang surpasses the taste regularly in the course of an evening, we know we’re in trouble. I don’t know how to adequately summarize or reduce all this to a simple conclusion. The thought that keeps recurring, though, is that when the number of dishes that leave us cold—dishes that do not contribute in the least to any desire to return—convincingly outnumber the dishes that wow us, that make us eager to come back, it is a very disappointing evening. And so it was. Last edited by Gypsy Boy on February 13th, 2018, 5:07 pm, edited 1 time in total. 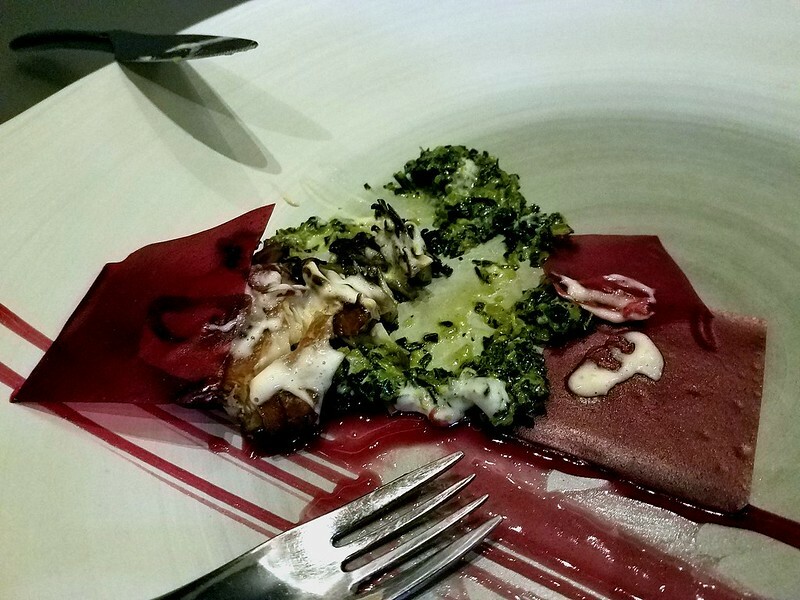 I have yet to go to Alinea, but a post like this has me wanting to rush back to Elizabeth, where the service has always been very homey and warm, and while not every dish has amazed me, the misses have been few and at least the combinations more organic (what's with that blueberry and mushroom at Alinea? That's just weird). One item of contrast: The bread service at Elizabeth is often the most substantial course, offering thick slabs of Chef Regan's wonderful bread, a garnished/infused or otherwise enhanced butter, and sometimes other wonderful things such as foie (I goggle over the tables that leave their bread uneaten -- high end dining is when you leave your paleo/low-carb at home). I've actually been to Alinea 2.0 (a year ago, most recently) as well as Elizabeth (a bit before that). 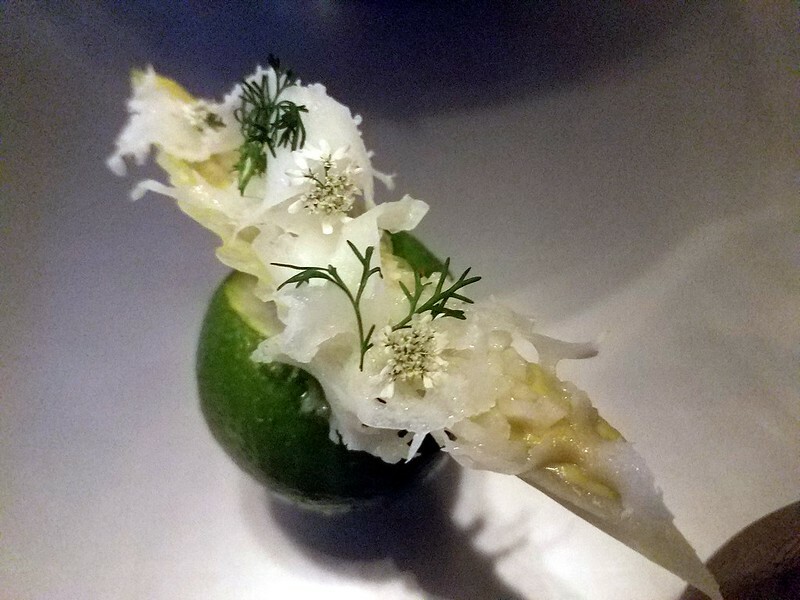 I'd say that the dishes at Alinea were roughly 75 percent amazingly delicious (and amazingly creative), 15-20 percent pretty good (and mostly creative), and 5-10 percent unpleasant or weird. Whereas the ones at Elizabeth were more evenly split - one third amazingly delicious, one third pretty good, and one third unpleasant or weird (which, overall, is still pretty good, except by the comparison here). 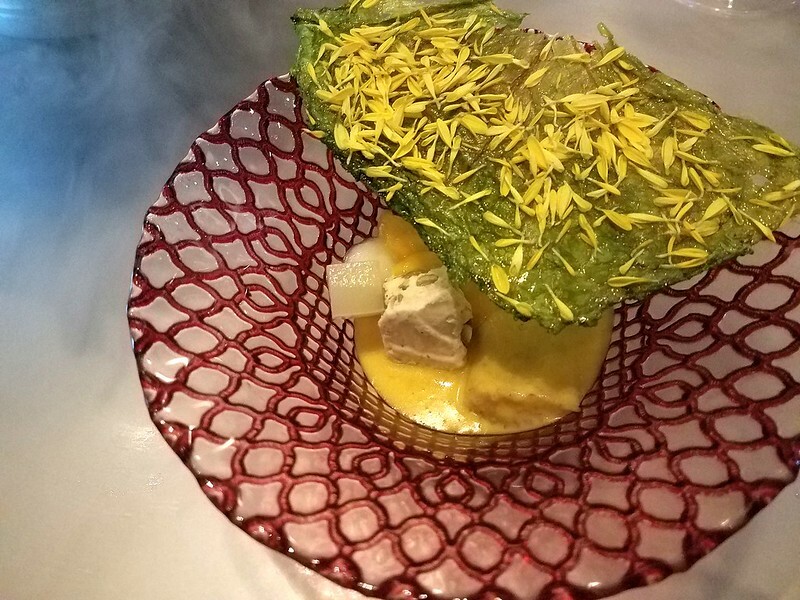 I've also found that the service at both has been knowledgeable and helpful, although warmer and more friendly at Alinea (borderline impersonal and cold at Elizabeth), without any of the gaffes mentioned above at either. 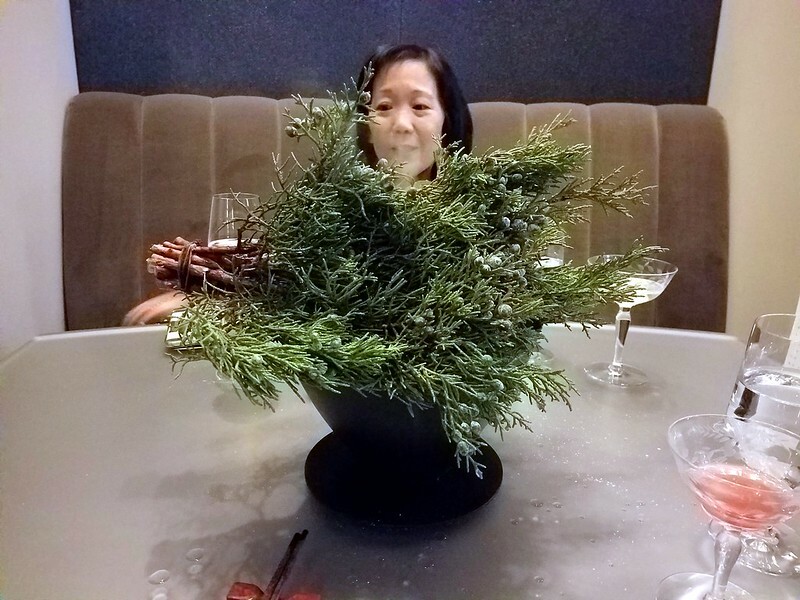 And of course, the price at Alinea was considerably higher, although we thought the wine pairings at Elizabeth were only so-so and a poor value. I'm not disputing Gypsy Boy's experience or opinion, only noting that my most recent experience there was not at all similar to his. Last edited by nsxtasy on February 9th, 2018, 8:36 pm, edited 2 times in total. Honestly, having eaten at (old) Alinea and Elizabeth, most of all I miss One Sister, though Oriole successfully scratched that itch for me. You should really try a place yourself, which is the best way to form an opinion. And when choosing where to try, I'd recommend concentrating on the opinions of those who have actually gone to a place themselves. As for your poor experience at Grace... I've eaten at plenty of fine dining restaurants, in Chicago and elsewhere. Most were excellent and thoroughly enjoyable; a few others, not so much. I dined at Grace twice. Once, it was outstanding, with creative, delicious food and some of the best service I've experienced anywhere. The other time, the food was generally good, but the service was customer-UNfriendly to the point of arrogance, and I too would describe that dinner as a "poor experience". (It was the only occasion in the past twenty years in which I wrote to the restaurant to express my disappointment.) I'm not trying to knock Grace here or fine dining in general, just noting that you need to go to a place to form an opinion, and even then not every place, even the most expensive, will necessarily knock it out of the park every time. Nsxtasy - I probably worded my post poorer then I intended, and didn't do a very good job of stating my thanks to Gypsy for the post. I most certainly rely on the opinions of the fine folks on this board who post wonderful pictures and thoughtful reviews. My real point was - my splurge meals are exhaustively researched, and when I see reviews pop up that are less then stellar it really makes me think twice. I probably didnt need to take another shot at Grace, or three star joints in general. 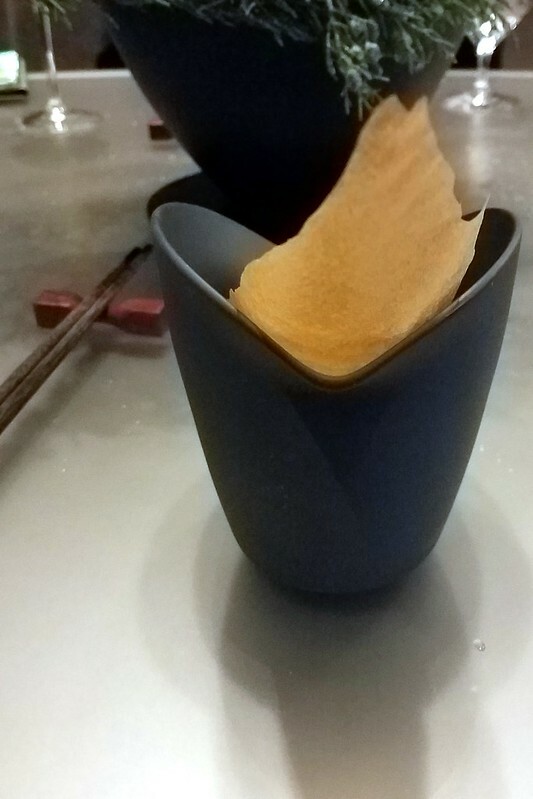 This past Friday, I enjoyed the one remaining format of Alinea that I had not yet experienced - the Kitchen Table. Still processing it all but when they say that the Alinea KT is the highest expression of what they do it is very accurate. Not exponentially more food (there IS more) but attention from the chefs and being right in the action is what this is all about. We had a couple of things that were special to the KT and one (a Thai inspired kanpachi course) was a la minute. This experience is for serious gourmands. It's not a romantic quiet intimate date night - this is a serious dinner experience for those who love to eat. It's less dinner theatre than The Gallery (think Ripley's Believe it or Not) but more theatrical than The Salon (which happens to be my favorite expression of the restaurant, more refined - along the lines of Per Se or the French Laundry than what Alinea was in 2012...). Daughter’s residency graduation, her dream was to dine at Alinea, fiance’s footing the bill, his future in-laws are allowed to tag along for the ride. Who am I to argue?! I knew about Chef Achatz, his history and the significance of the place—the awards and the rest. But I didn’t view his Chef’s Table retrospective on Netflix until the other day, well after our visit. And I think that was a good thing, for I was pretty much unprepared for his tricks of the trade that turn dinners into events. Sat downstairs at a long, wide table with other patrons, discomfortingly far away across-wise from daughter and fiancé. How in the wide world of sports are we supposed to converse, and with strangers next to us to boot? The Gallery Menu for reference. Standard Pairing for wine. Thanks Royal Lichter for the advance intel! A hazy dome, opened to ‘Communal’. The interaction of Osetra caviar, sturgeon mousse and lemon tapioca covered by a cool, creamy parsnip soup was incredible, possibly my favorite course of the night. 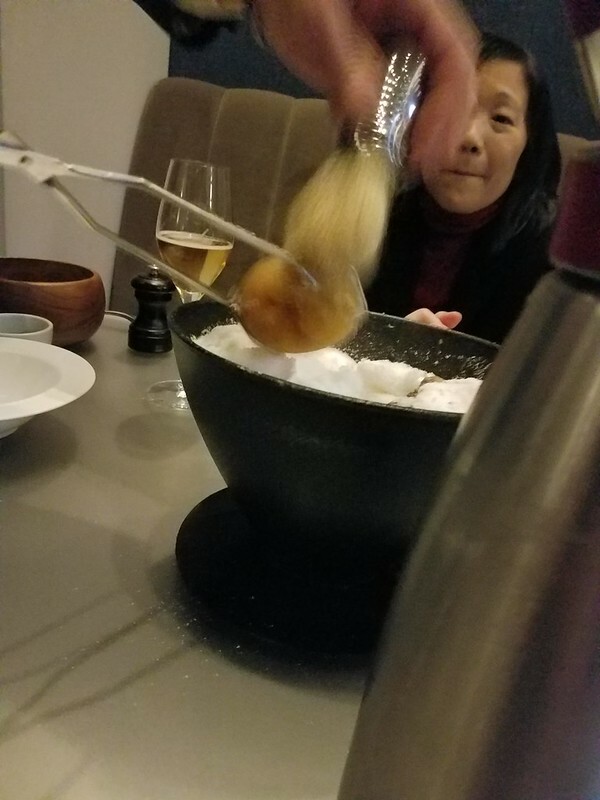 Next, we were led into the kitchen—with Chef Achatz at our back—for ‘Shaker’ (a magnificent gin, root beer and tincture of basil cocktail) and ‘Pocket’, consisting of a light but intense explosion bite that included parmesan foam—great pizza taste in a different form. We then returned to the main dining room and voila--during our absence the seating had been transformed into round 4-tops, putting me at ease from my prior trepidation. Sleight-of-hand at work again! ‘Wet Snow’. There was definitely a fruit/seafood correlation being established. ‘Spear’. One of my favorites. The tactile crunch, the marriage of the ingredients plus coriander flowers was spot-on. ‘Glow’. Another bite-sized explosion of nothing but perfectly-balanced orange. ‘Ranina Ranina’. By consensus, in the top echelon of courses. Crab, curry, coconut, dehydrated cabbage leaf & pumpkin seeds. Yin and yang, totally weird & I wanted more. One of many examples during the evening of centerpiece art as an integral part of the experience. Equal air flow distribution of aroma to each diner! Right to left, ‘Ink’ and ‘Black’. Not particularly memorable, but just a comment that the plating was fabulous throughout. Chef appeared at various times throughout the evening, not saying much but intensely focused. ‘The Cape’ / ‘Old Bay’. Potato for this chowder was cooked in salt in a smoldering centerpiece, unknowingly to us as we chatted. ‘Coal’. Excellent pairing of Syrah, the only red of the evening. Getting a wide shot of the ‘Umami’ plating was key, with ‘Bean’—a smoky, vanilla-infused jerky in a jar, in the background. Loved the foie/mushroom handshake. 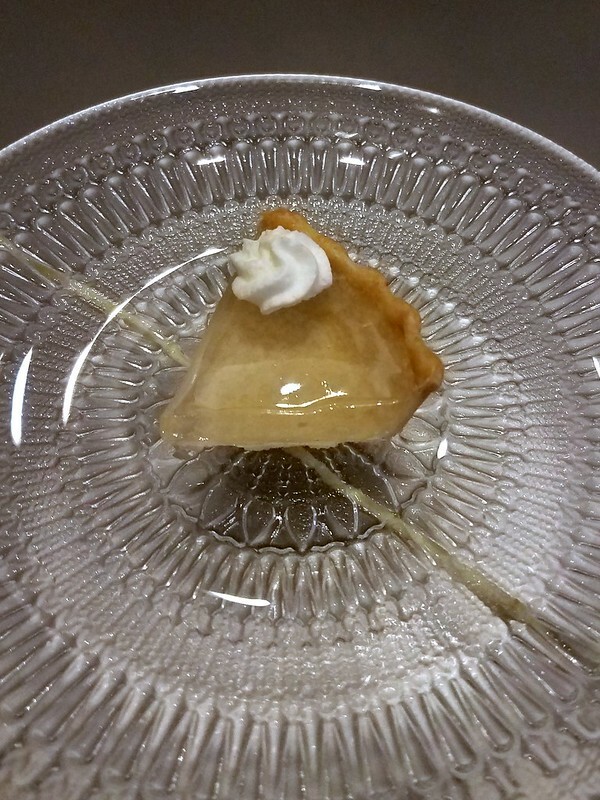 I thought the savory dessert ‘Air’ was the only fail of the night, only because I’m not a goat cheese fan. I’ve seen ‘Shot’ before, and it was fun, much like the not-pictured-here ‘Balloon’, in which the introduction of helium can be counted on to be a sure-fire, no-brainer party favor. Laughs galore. ‘Still Life’. When is a banana not one? When it’s only shaped like one with an eruption of vanilla flavor. With an ’07 Hungarian dessert wine that could’ve passed for a killer port. I’m telling my future son-in-law that his suspicion that one of these large suspended discs were going to end up on our table was misguided, but I was wrong. ‘Paint’. I’ve seen various permutations over the years, and this rendition didn’t fail to please, with wonderful brewed coffee. The finale—‘Nugget’ with sesame, brown butter & gold. 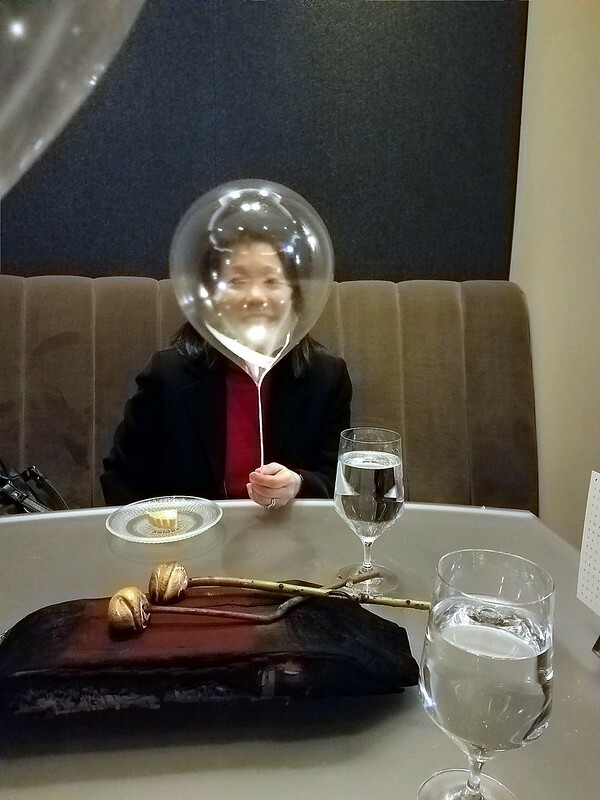 Almost more than the food itself, I was endlessly amazed at the top-notch efficiency and sheer choreography of service over our nearly four hours at Alinea. You’re in the play, but of critical importance is that the key to total enjoyment is to buy into the play. And for the cost, why would you not, seriously? Not once was any server not fully schooled on any question we had, no matter how detailed or obtuse. And the folks descending the stairs from the upper floor heading toward the kitchen course had that same look of wonderment that we had had an hour or two before. I thought to myself, folks, you’re going through the looking glass now. Adding to the gravity of our dinner at Alinea was the word earlier in the day of the passing of Anthony Bourdain. Both he and Chef Achatz seemed cut from the same cloth of culinary passion, although taking decidedly different paths to stardom. While I was a full-on Bourdain disciple, my night on Halsted for the first time opened all my senses fully as cuisine without putting them on overload, which is a fine line to walk. Thanks, Chef, for an extraordinary evening. 2 friends and I have a reservation for Alinea’s Kitchen Table this Wednesday, 8/15 @ 9:30PM. We’re looking for up to 3 more people to fill out our 6-person table. The Kitchen Table is completely private and is, in their own words, Alinea’s “highest dining expression”. Tickets are $500/each and cover food, tax and gratuity (not booze). We’re 3 guys, all in our 30s. We’ve had the good fortune at dining at some great restaurants and can’t wait for this experience. So if you’re interested in eating some amazing food and getting respectably intoxicated with us, shoot me a note! Could anyone speak to the wine pairings at Alinea 2.0? Trying to decide which of the 3 pairings to get. In the wake of the fast food at the White House, Alinea invited the Clemson Tigers over for dinner. For real. Yeah, I can just see a 330 lb lineman get a big bowl with 4 freeze dried peas in it. Now if Gibson's offered that would be a different deal. Puckjam wrote: Yeah, I can just see a 330 lb lineman get a big bowl with 4 freeze dried peas in it. Now if Gibson's offered that would be a different deal. 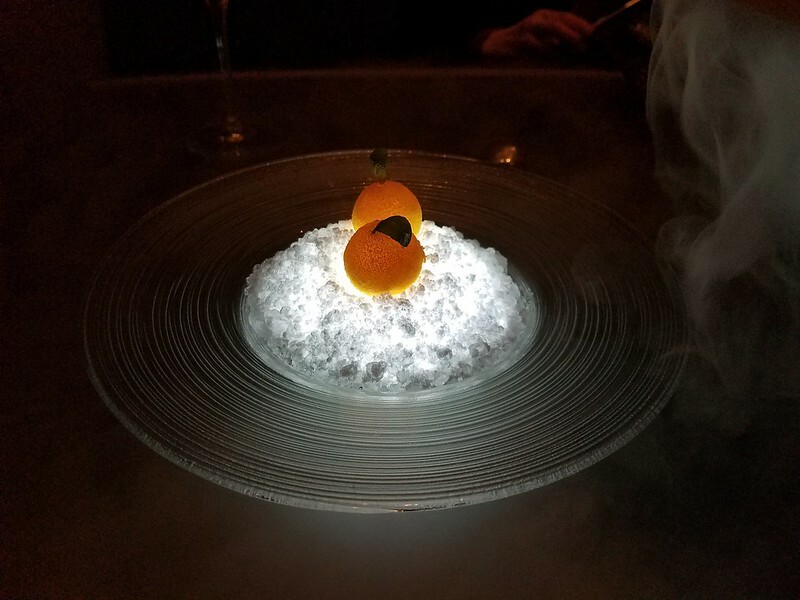 Have you ever been to Alinea? It's a substantial amount of food -- sometimes, even crushing -- and I doubt anyone would go hungry, especially since it's not like Alinea wouldn't know who they'd be serving. More likely, though, the skill, artistry and quality would be at least partially lost on this audience. Many of the players are probably too young and inexperienced to fully appreciate it. No, but hope to some day. You got the point though, I think they might be a bit bewildered and a big steak would be more up their alley. Puckjam wrote: No, but hope to some day. You got the point though, I think they might be a bit bewildered and a big steak would be more up their alley. Understood but having been there a number of times, I can say that it is usually A LOT of food. Many years ago I went with a "substantial" out-of-town friend who, before our meal, openly suggested online that he was fully prepared to order a pizza to his hotel room after dinner. 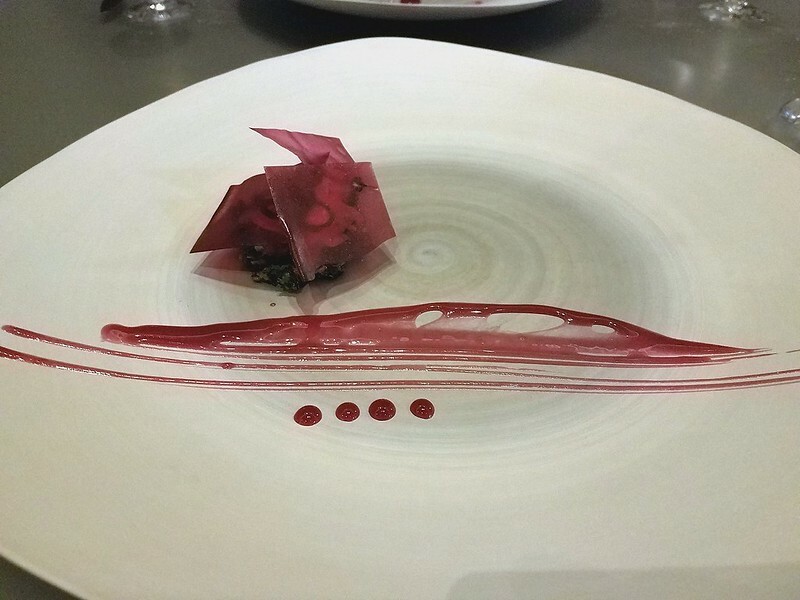 Well, it was clear that Chef Achatz and Company had read his post. Not only did a tremendous number of dishes come to the table but several that I'd had before were notably larger in size. About halfway through the meal, my friend, in a cold sweat, retreated to the mens room and took a couple of courses off. He'd been shut down! Later, we all had a good laugh over it. But the lesson was learned: Never taunt Chef Achatz! The larger point here is that if the Clemson football team were to dine at Alinea, I've no doubt that Achatz & Co. would gameplan well and send them hope happy. And it's not Nick K's style to talk the talk without being able to walk the walk. He made this offer knowing full-well that it might result in the team actually coming to dinner at Alinea. 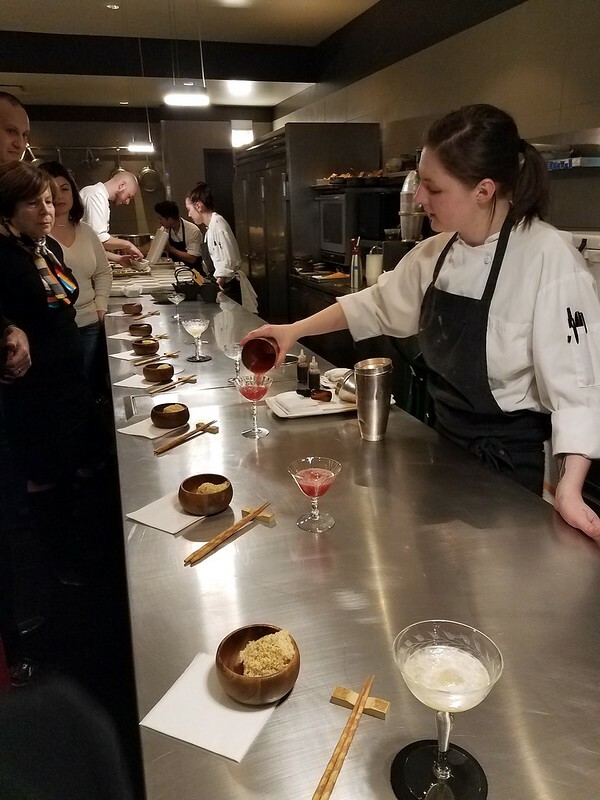 You're probably right that at least initially, these young'ens might prefer Gibson's but a meal at Alinea would definitely expand their horizons, and isn't that at least part of what the college experience is supposed to embody? I'm certain that at least a few Clemson Tigers would truly appreciate it and walk away from the experience better off for it. ronnie_suburban wrote: He made this offer knowing full-well that it might result in the team actually coming to dinner at Alinea. I think he's safe. The NCAA isn't know for letting logic or the interest of the athletes take priority when it comes to this kind of stuff. This is the same organization that suspended a player because a teammate's dad gave him basketball tickets. That said, if they do come, I'd think Achatz could put together a fun meal that would take into account the palates and appetites of the young diners. Hopefully it would include a burger or two. Haha, yeah. I forgot who we're dealing with here. I guess the possibility does seem pretty darned remote. Thanks, Grant sounds great and I did not know the flow there. I just remembered seeing a segment on TV about the freeze dried peas and it stuck in my head. Though, now I want to experience it even more. Nonetheless, as good as he can make a meal for them, I think the majority would rather have the steak and its basic surroundings. I ate at Alinea a few weeks ago and "a big steak" was one one of the dishes. Although it tasted excellent, it was probably the least interesting and exciting dish we were served.